As a solo artist, it gets even more confusing. I’ve gone back and forth on The End of the Innocence over the years, considering it either a masterwork or a cheese-fest. The title song, ‘The Last Worthless Evening,’ ‘New York Minute’ and ‘The Heart of the Matter’ are superb, no doubt, but ‘Little Tin God’ and ‘Gimme What You Got’ make me cringe. 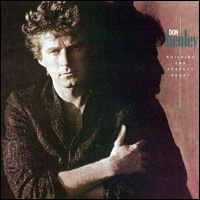 There is no dispute, however, over ‘The Boys of Summer.’ Henley’s first solo smash remains a freaking masterpiece despite my mixed feelings about the rest of his discography. This is a song to put in a time capsule or shoot into outer space. This entry was posted in song of the day and tagged Building the Perfect Beast, Don Henley, The Boys of Summer. Well, YouTube pulled down your clip, but I certainly know the song well enough to comment anyway. I agree that Henley’s work has not always been my cup of tea, although, for me, it has more to do with his occasional foray into country, both with the Eagles and solo. Your dislike of “Hotel California” is, quite frankly, incomprehensible to me as it is probably amongst the greatest rock songs of all time (and is frequently lauded as such by critics). Still, while there may be lesser moments and songs on both Building the Perfect Beast and End of the Innocence, the highlights are better than almost anything else that was done at the time or since. For me, Beast is the stronger album, not only because of this song, but because of the incredible one two punch of “A Month of Sundays” and “Sunset Grill,.” Those songs move and thrill me as much now as the first time I heard them. Here’s “A Month of Sundays” for those who may not know it: Unfortunately, I can’t seem to find “Sunset Grill” on YouTube. Of the aging artists you have featured this week, Henley, Clapton and Van Morrison seem to be examples of artists where you probably own the best of their work and there may not be a compelling case to be made for seeking out more. The same cannot be said for Hornsby and Jackson Browne, as I think by only only the debut album in Hornsby’s case and the biggest selling album in Browne’s case, you are really missing out on some great stuff that I’m fairly sure you would love. Then again, you cringe at “Hotel California” so who knows? Boys of Summer: Absolutely epic song.